Jockey Noel Callow rides Magnesium Rose to victory at Caulfield Racecourse in Melbourne. Trainer Matthew Lindsay has celebrated his second city win on his home track at Caulfield with Magnesium Rose. The three-year-old filly is so far the only horse Lindsay has had race as a trainer and took her record to three wins from nine starts. Magnesium Rose won on debut at Bairnsdale almost a year ago to give Lindsay, who also works as an assistant to Caulfield trainer Colin Little, a winning start to his fledgling training career. 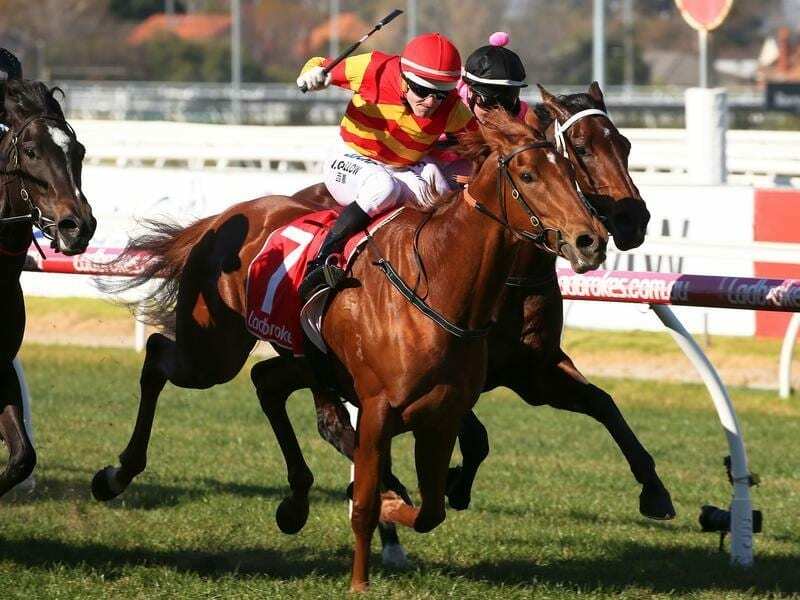 In the past 12 months Magnesium Rose has added two city wins at Caulfield and three other city placings, including her victory on Saturday in the Ladbrokes Back Yourself Handicap (1200m). “She’s a godsend. You can’t dream about having a good horse like this this early in your career,” Lindsay said. Magnesium Rose ($3.60 fav) kept lifting over the final 200m in Saturday’s race under jockey Noel Callow and held off a late run from Soul Star to win by a long neck with another short neck to Atlantica third. “It’s a great thrill,” Lindsay said. Magnesium Rose was having her third start of her current preparation but went in having had more than a month between races because she had to overcome a hoof abscess since her third placing at Sandown on June 6. “We gave her a six-day break in the paddock after that run at Sandown because she likes to be kept fresh, but she got a hoof abscess which usually isn’t that big a problem but it just seemed to linger on for a little while,” Lindsay said.